I know very little about golf and my only sight of the golf course at Tin Can Bay has been as I drove by on the road. However, when someone told me that I could see Bush Stone-curlew (Burhinus grallarius) there nearly every day I had to get a closer look. I contacted Mike Clifford who is a member of the committee of the Country Club and he told me it would be OK to go and look as long as we were not there at a time when there were golfers wanting to play. He also said he would show us where the birds could usually be found. The golf club is beautiful! It was early in the morning and there were birds walking around where later on there would be golfers. Mike led us to the curlews right away. I concentrated on photographing the birds and Janet looked at the bigger picture and got some great pictures of the golf course. The curlews were in some longer grass under the trees. 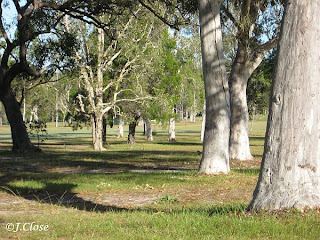 Some were standing quietly in the shade of the trees and others were sitting down almost hidden in the grass. Their colouring makes them very hard to see in this habitat. They only moved when we got too close. When I wondered why they were not disturbed by all the people around later in the day, Mike reminded me that golfers do try to stay away from the trees. Of course! Bird watching at Inskip Point is always interesting. 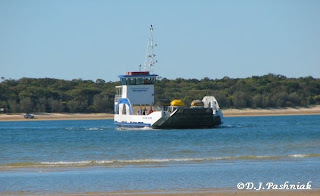 This is just across the channel from the southern end of Fraser Island which is the largest sand island in the world. There are large numbers of terns, and most of the shorebirds found in the bay can also be seen here. There are also shorebirds here which prefer the more open sea coast and so are seldom seen further into the bay. At high tide there is a large sand bank in the channel just west of the point. The birds use this as a roost. You can see the larger birds quite clearly out there with a spotting scope. However, kayaking over to the sand bank is even more interesting. 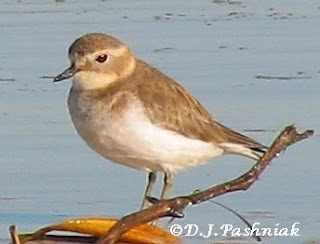 When I went out there last August I saw Double-banded Plovers (Charadrius bicinctus) in almost full breeding plumage. At that time they were getting ready to migrate south to New Zealand where they breed during the southern hemisphere summer. Now they are back in non-breeding plumage and will spend the winter here. When I saw them they were roosting with a flock of small waders. They were all very hard to identify as they sat on the sand with their heads tucked down. 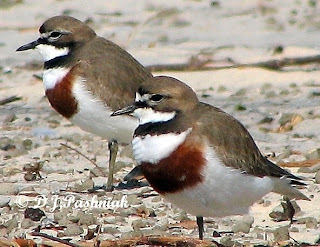 When they moved it was easier to see them – Red-capped Plovers, Red-necked Stints and Double-banded Plovers. The Red-capped Plovers are resident here, and the Red-necked Stints are juveniles that have not migrated to the northern hemisphere to breed.